One of the fun parts of life is taking some time to get away on a retreat. It’s fun to go away with a church group or work colleagues or for a family reunion. A great way to preserve the memories of that time is to design and give or sell everyone a custom retreat t-shirt. We can even help you create a memorable design to put on it. Sharptown Methodist Church ladies have taken retreats for a number of years. 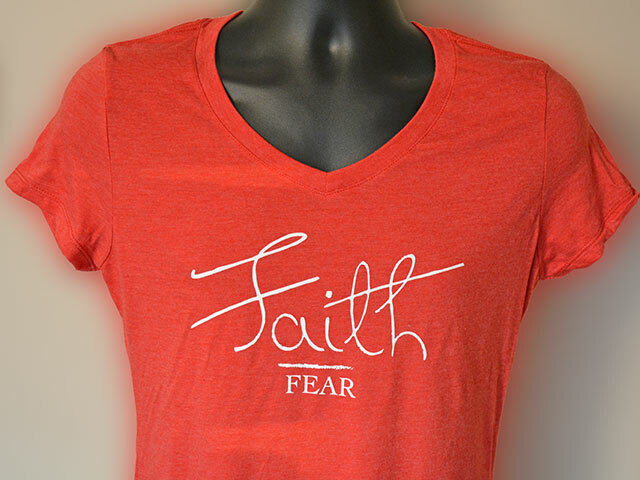 They always create a special t-shirt related to their retreat, like this one, featuring their theme with a clever graphic illustration of faith over fear. The world of t-shirts has changed so much, there is a style to suit every occasion. From ladies’ soft v-neck tees to inexpensive durable heavy cotton t-shirts and high-end brand-name or USA-made t-shirts, you can find exactly what you’re looking for. You can even get your own private label added to the shirts if you want to market your own line. With the growth of the casual shirts in the workplace, it’s completely appropriate to offer your employees t-shirts with your branding on them. Given how many choices and various levels of quality t-shirts there are, it’s worth working with a professional. D and S Designs has been printing t-shirts since 1991. We keep up with the constantly-changing trends in the market. To get expert help in selecting the right t-shirt for your retreat or other purposes, contact us. We are happy to help you find the perfect shirt for you.